Big Tobacco Is Spending $17 Million To Block A Montana Tobacco Tax : Shots - Health News If the state's ballot initiative to fund Medicaid's expansion passes, it will mean a $2-per-pack increase in taxes on cigarettes and a new tax on electronic cigarettes. 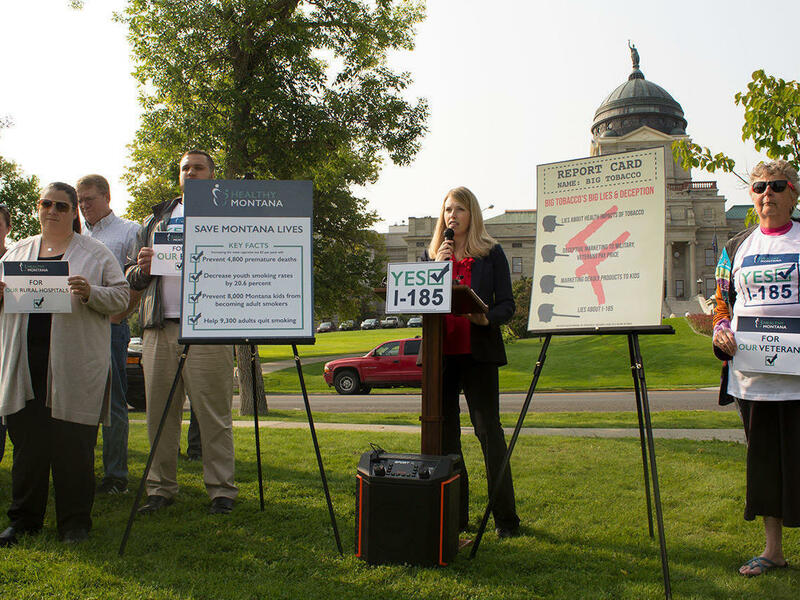 Amanda Cahill, a supporter of Montana's tobacco tax measure, I-185, at a press conference near the state capitol last August. Tobacco firms have spent $17 million in opposition to the initiative, compared to an $8 million campaign by those in favor of it. Montana legislators expanded Medicaid by a very close vote in 2015. The measure passed with the condition that the expansion of Medicaid eligibility in the state would expire in 2019 unless lawmakers voted to reapprove it. And once it expired, people who got Medicaid under the expansion would lose it. Fearing legislators might not renew funding for Medicaid's expanded rolls, Montana's hospitals and other health advocacy groups have come up with a ballot measure to keep it going — and to pay for it with a tobacco tax. Amanda Cahill works for the American Heart Association and is spokesperson for Healthy Montana, the coalition backing the measure, which will be on Tuesday's ballot. She says coalition members knew big tobacco would fight back. "We poked the bear, that's for sure," Cahill says. "And it's not because we were all around the table saying, 'Hey, we want to have a huge fight and go through trauma the next several months.' It's because it's the right thing to do." If ballot initiative I-185 passes, it will mean an additional $2 per pack tax on cigarettes, and a tax on other tobacco products. It would also levy a tax on e-cigarettes, which are currently not taxed in Montana. The tobacco tax initiative has become the most expensive ballot measure race in Montana history — drawing more than $17 million in opposition funding from tobacco companies alone — in a state with fewer than 200,000 smokers. Most of that money has come from cigarette maker Altria. According to records from the National Center for Money in Politics, that's more money than Altria has spent on any state proposition nationwide since the center started keeping track in 2004. Meanwhile, backers of I-185 have spent close to $8 million on the initiative, with most of the money coming from the Montana Hospital Association. "What we want to do is — No. 1 — stop Big Tobacco's hold on Montana," Cahill says. Also, she continues, it's imperative that the nearly 100,000 people in Montana who have Medicaid under the expansion will be able to keep their health care. Cahill says I-185 will allocate plenty of money to cover the expansion, though some lawmakers say the state can't afford it. Kristin Page-Nei, government relations director of the American Cancer Society in Montana, was one of the authors of measure I-185, which would raise state taxes on cigarettes and other tobacco products. 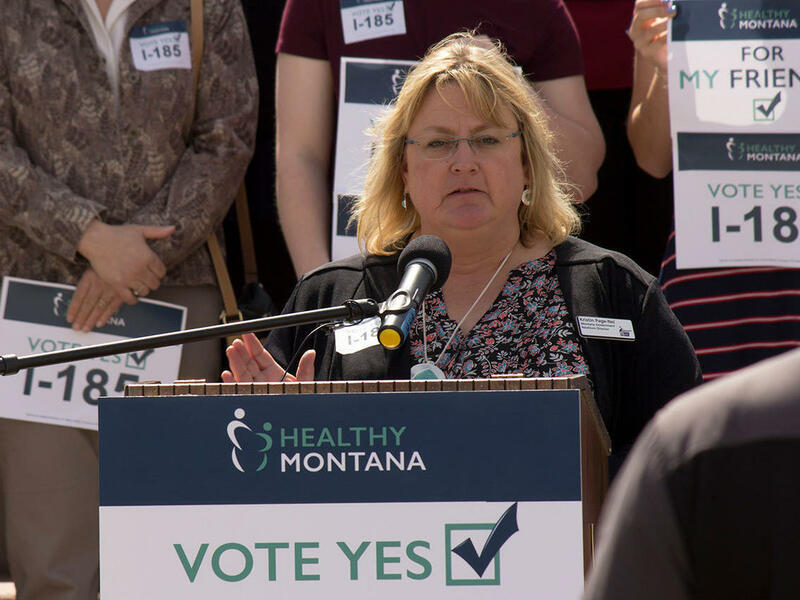 Nancy Ballance, a Republican representative in the Montana state legislature opposes the measure. "In general I am not in favor of what we like to refer to as 'sin taxes,' " Ballance says. "Those are taxes that someone determines should be [levied] so that you change people's behavior." Ballance also isn't in favor of ballot initiatives that, she says, try to go around what she sees as core functions of the legislature: deciding how much revenue the state needs, for example, or where it should come from, or how it should be spent. "An initiative like this for a very large policy with a very large price tag — the legislature is responsible for studying that," Ballance says. "And they do so over a long period of time, to understand what all the consequences are — intended and otherwise." Most citizens, she says, don't have the time or expertise to develop that sort of in-depth understanding of a complicated issue. Montana's initiative to keep Medicaid's expansion going would be a "double whammy" for tobacco companies, says Ben Miller, the chief strategy officer for the nonprofit Wellbeing Trust. "People who are covered are more likely to not smoke than people who are uninsured," says Miller, who has studied tobacco tax policies for years. He notes research showing that people with lower incomes are more likely than those with higher incomes to smoke; and if they're uninsured, they're less likely to quit. Federal law requires Medicaid to offer beneficiaries access to medical help to quit smoking. Plus, Miller adds, every time cigarette taxes go up — thereby increasing the price per pack — that typically leads to a decrease in the number of people smoking. And that, he says, works against a tobacco company's business model, "which is, 'you need to smoke so we can make money.' "
Ballance agrees that tobacco companies likely see ballot initiatives like I-185 as threats to their core business. But, she says, "for anybody who wants to continue smoking, or is significantly addicted, the cost is not going to prohibit them from smoking." The U.S. Centers for Disease Control and Prevention says tobacco use is the leading cause of preventable disease and death in the U.S.
Montana's health department says that each year more than 1,600 people in the state die from tobacco-related illnesses. This story is part of NPR's reporting partnership with Montana Public Radio and Kaiser Health News.